Estonia, the northernmost of the Baltic states, has a reputation of being one of the most secularized countries in Europe. Although the visibility of religion is rising, being ‘not religious’ is still considered normative. Estonia is a context in which notions and debates on religion, atheism, and indifference are interrelated in complex ways with the history of Estonian nationalism, and two foreign religious-secular regimes: German Lutheran and Soviet Atheism. In this interview, Chris and Atko Remmel discuss why the Estonian context is – or should be – interesting to scholars of ‘religion’. What happened during the Soviet era? What about the academic study of religion in Estonia? How did the strong connection between Estonian national identity and ‘atheism’ develop? How does this play out in the contemporary context? This interview was recorded at the European Association for the Study of Religions’ 2018 conference on Multiple Religious Identities in Bern, Switzerland, and concludes by looking ahead to the 2019 EASR conference in Tartu, Estonia. You can download this interview, and subscribe to receive our weekly podcast, on iTunes. If you enjoyed it, please take a moment to rate us. And remember, you can use our Amazon.co.uk, Amazon.com, or Amazon.ca links to support us at no additional cost when buying academic texts, waffles, canned sardines, and more. Podcast with Atko Remmel (28 January 2019). Christopher Cotter (CC): The Estonian case in the study of religion is something that we’ve not really talked about very much on the Religious Studies Project. But I am speaking to you right now from the EASR conference in Bern where I’ve been hearing quite a bit about it. I’ve heard some papers, and it was even mentioned quite a bit in one of the keynote lectures yesterday. And so I thought it would be fantastic to get Atko Remmel, who I’ve known for a number of years now, onto the RSP to talk about the Estonian context, the study of religion in Estonia and some of the complex intersections between religion, non-religion, nationalism in this context that’s sort of been dominated historically by two foreign religious secular regimes: the German Lutheran Church and Soviet atheism. So first of all, Atko Remmel, it’s my pleasure to welcome you to the Religious Studies Project. Atko Remmel (AR): It’s nice to be here. Thank you for having me. CC: It’s an absolute pleasure. Just to say, Atko is senior researcher in Religious Studies and also a researcher in Cultural Studies at the University of Tartu in Estonia. And his work discusses religion, religious indifference, national identity and more, in Estonia, which is set as I’ve indicated, to be one of the most secularised countries in Europe. He has a number of publications in this broad area, including one called “Religion Interrupted: Observations on Religious Indifference in Estonia“, which is in a book, in which I and a number of RSP friends have chapters, that’s called Religious Indifference: New Perspectives from Studies on Secularisation and Non-religion, edited by Johannes Quack and Kora Schuh. And Atko is also the PI on one of the Understanding Unbelief projects, looking at Estonia. But we’ll not be talking too much about that just today. So, many of our Listeners out there may never have really thought much about the Estonian context at all. So, perhaps the way to start would be a broad introduction to Estonia, I guess, in relation to religion. A potted history! Away you go! AR: Well, Estonia is a small country, by the Baltic Sea – one of the northern-most Baltic countries. And yes, it’s known for its very far-reaching secularisation. CC: Yes. So we’ll be talking a lot about that in a moment, but the study of religion in Estonia: is that something relatively new – like Religious Studies, at an academic institution? AR: Well actually, no. But to answer this question we have to look back into history. So, during the Soviet Union the only possibility to study religion was within the framework of Scientific Atheism. And another possibility was Folkloristics, where folk beliefs were studied as a part of national heritage. And after the collapse of the Soviet Union, Scientific Atheism of course faded away. And the Study of Religion was newly established under the label of Theology which, in Estonia, is an umbrella term for both Theology and the Study of Religion. And this, I would say, in the early days was more influenced by theological thinking. But in the last decade it has moved towards the Study of Religion. And the focus is on religious change, new religious movements, but mostly it’s still about Christian churches and their relationship to the state. And apart from that, religion is still studied under the discipline of Folkloristics, which in the Estonian context is another umbrella term that covers anthropology, ethnology, ethnography, but also folkloristics in its traditional sense. Since Estonia is in a bit better position than other Finno-Ugric nations that were incorporated into the Soviet Union, my colleagues have a keen interest towards their religious situation, language and so on. CC: And of course, we’ll be hearing at the end of the interview, I hope, about a certain conference that’s going to be happening in Estonia, hosted by the Estonia Association. So it’s clearly been something that’s developing there. You mentioned the Soviet times there, and I suppose anything that we’re going to talk about in the rest of this interview will probably require a bit of historical contextualisation. So the stereotype we have is obviously (5:00) Soviets were not a massive fan of religion – suppression – end of Soviet time – maybe some sort of resurgence. But let’s . . . . Give me an actual picture. AR: Well, it’s correct that the usual understanding of Soviet anti-religious policy is understood as something monolithic that was uniform from the start to the end. But actually, there were quite big changes in religious policy. And in some periods it was harsher, and other times less harsh. And after the Second World War, during Stalin‘s reign, the question of religion was sort-of secondary. But it changed radically under Nikita Khrushchev, who initiated an anti-religious campaign that lasted from 1958 until 1964. And in Estonia this policy had three main directions: the first one was so-called administration of the churches, which meant that different kind of legislative restrictions and direct control over the inner life of Churches; the second one was ethics propaganda for newspapers and lectures; and the third one was the development of Soviet secular rituals, to substitute religious rituals. And I would say that this administration and secular rituals were most effective. And as a result they manged to create an interruption in religious tradition, and to get rid of religion from public space. This, of course, didn’t mean that they managed to turn people into atheists. And, apart from the years of the Khrushchev anti-religious drive, atheist propaganda was actually not very visible. And atheism was one of so-called “red” subjects closely associated with the hated Soviet ideology. And also the level of atheist propaganda was quite low. And therefore it didn’t appeal to people. And so the result was widespread indifference both towards religion and atheism – like a sort of ideological vacuum, which was filled with all kinds of things when the Soviet Union finally collapsed. And this actually explains why Estonians, while considering themselves not religious, have a plethora of different beliefs and practices and so on, which are usually – in student terms – alternative spiritualties. CC: Excellent. Thanks for that. This might be putting you on the spot a little bit. But, just for those of our Listeners who aren’t familiar with the dates, could you maybe give us the key dates in the 20th century, in Estonian history? AR: In Estonian history . . . . Well, Estonia was at first occupied by Soviet forces in 1940, then again in 1944, then Joseph Stalin died in 1953, Khrushchev was pushed aside in 1964, and then finally the Soviet Union collapsed in 1991. CC: Fantastic. I just wanted to make sure that we got that in there. I guess if our Listeners have seen “The Death of Stalin” they might be familiar with Khrushchev. CC: Excellent. So you’ve already alluded, there, to the suppression of religion and how this, maybe, largely succeeded in the public space. But a lot of your work, then, has been focussing upon contemporary surveys, and how effective this might have been on individual lives. So, let’s get specifically into your own research. You might just want to tell us a little bit about your research journey – the kind of questions that you’ve been asking – and then, what it can tell us about religious indifference, non-religion. And then we’ll get onto this national identity element, as well. AR: Well . . . long story short. I started out as a historian and my PhD thesis was on the institutions that were involved in Soviet anti-religious policy. It was mainly archival work. And by the time it was finished, in 2011, then the research on non-religion was already booming. (10:00) And then I got interested in how this Soviet background influences contemporary Estonian society. And by that time Estonians had already discovered this forgotten link between atheism and Estonian national identity. So for the last 4-5 years I have tried to keep a track on what’s happening in Estonian society, in connection with religion and non-religiosity. And I’m currently involved in several projects that touch these subjects. And one of them is on the Relocation of the Sacred around the Baltic Sea, which is led by my good colleague from Sweden, David Thurfjell. And it deals with the relationship between secularisation and nature spirituality. Another approach, which you already mentioned, was this Understanding Unbelief. And, in addition, we are – together with colleagues from the Czech Republic – we are compiling an edited volume with a preliminary title: Atheism and Freethinking in Central and Eastern Europe, which focusses on the twentieth and twenty-first century. And it’s a combination of historical and sociological approaches. And, hopefully, will be the first comprehensive overview of the development of current states of secular developments in that region. CC: Fantastic. So how about we dive right into it, then? One of my favourite anecdotes from your presentation yesterday – and this might serve as a useful starter – was when the survey question, “Should the churches modernise?” was being asked. And people who were religious, people who were non-religious were maybe ticking agree, slightly agree, don’t have any opinion, vastly disagree. All over the place. And when you actually got to your qualitative work, the story was, “Should the churches modernise? Should they have electricity? Should they have Wi-Fi?” So, even the vocabulary of the questions were sort-of indicating what you might describe as secularisation of language. CC: So, maybe that’s a way into the conversation? AR: And another thing – that you mentioned – is religious illiteracy. And also this secularisation of language. So this religious illiteracy: since religion in Estonian Society has had really low visibility, people sort-of don’t recognise the appearances of it. And they also are unable to express their thoughts about religion because of the lack of knowledge. And there is a really interesting story. In Turto there is a Marian Church that was turned into a gym during the Soviet era. And the bell tower was demolished and so on. But it still had the very specific features of a sacral building, like large arched windows and so on. I heard from my informants that when they were children, during the Soviet period, that when this building was finally given back to the congregation and turned into a sacral building again, they were really surprised when they learned that it was actually a church building! So we can call it a “religious blindness”, or something like that. And secularisation of language is the third interesting feature which I have found. It’s actually not so much secularisation. (15:00) It’s more like de-Christianisation: when religious terms have run dry of their Christian context. This example of church is sort of a text-book example. Where church is understood only as a building, not an organisation, or a group of people. So it can create a lot of confusion. So, yes. And then I got interested in that, because I had a hunch that non-religious people might not understand the questions in the surveys in the way they were meant to. And to some extent it seems to be true. And also it seems to be true that many questions asked in the surveys just prompt the answers, and have no relevance to people before and after that. So I’m a bit hesitant how meaningful this collected data is. And, of course, it’s always a problem but it can have much more serious results in a context where religious illiteracy is more widespread. CC: Absolutely. It might help if we get some percentages here. I know that you had them in your presentation. You mightn’t have them to hand. But in certain surveys it’s quite an extraordinarily high number of, we might say, atheists – you might say non-identifiers, depending what the survey is. But then, on this national identity front, I notice that there was a large population of Russian Orthodox in Estonia. And so, maybe you could comment on the sort of connection between – I don’t know – Estonia, and atheism, and Russian Orthodoxy as it plays out? AR: Yes. The point seems to be that orthodoxy is much stickier than Lutheranism. And the story with Estonians is that one of the things is the Estonian national narrative, which is a construct from 19th century, and tells a story about the Estonians’ everlasting fight for freedom. And there are two types of national narratives. One is the Golden past, another is the Promised Land. And Estonian one is the Golden Past type. But, usually, this Golden Past refers to the time where the country was very powerful, great kings and so on. But in the Estonian case this Golden Past is located into pre-Christian times. And Christianity is sort-of seen as responsible for its demise. And another thing is this connection between Estonian nationality and atheism. And it’s a really interesting story. But it has actually very little to do with believing or not believing in the existence of God, and rather it started out as an ethnic conflict. So the background is that Estonians were Christianised in the 13th century, during the Northern Crusades. And after that they were ruled by different other nations, until the 20th century. And this 19th century Romanticism resulted in the rise of Estonian national consciousness. And by that time, Estonia was incorporated to the Russian Empire, but Estonians were ruled by a Baltic German upper class. So most of the clergy was also German. So the Church was not perceived as Estonian, but more like German. Now, in 1905 there was a revolution in Russian Empire, and in Estonia as well. But in Estonia it took a sort-of nationalist form, so it was a fight for national autonomy. And the revolution was soon crushed and punitive squads started to do their work. And many people were executed. And then many Estonians accused German pastors that they didn’t protect their parish members, and rather collaborated with the troops. And, as a result, many Estonians didn’t go to Church any more. And, in return, Baltic Germans accused Estonians of atheism. And during the Soviet era, atheist propaganda, of course, made good use of both motives. (20:00) And then it created a new story of Estonians as historically being very sceptical towards religion, or being a religiously lukewarm nation. So in 2005 the Eurobarometer survey was published, and that revealed that only 16% of Estonians believe in a personal God. And all this information was happily put together. And Estonians started to understand themselves as the least religious – or most atheistic – country in the world, despite the fact that the survey covered only Europe! AR: However, Estonians are actually not the only ones with this claim, and similar motives are present also in the Czech Republic, in Denmark, in Sweden, and in the Netherlands. So I question which country will be the least religious or most atheistic. It’s probably going to be a new Olympic Games discipline or something like that! CC: Yes! And I wonder what the prize will be? CC: You also had a leaflet in your presentation that said, “If you are an Estonian. . .” and listed a few things. It said ,“you do not believe in God . . . unless it’s Eurovision!” (Laughs). CC: Now I’ve only really got one more question before we talk about that important conference. But presumably, this isn’t getting the whole picture. You were showing a lot of nuance yesterday, and a lot of the beliefs and practices that these so-called non-believers, non-identifiers subscribe to. So maybe you could add a bit more nuance to this contemporary situation? AR: Well, I will say that when we are talking about non- believers or atheists, then it basically boils down . . . that means that we are taking their identity as primary indicator, when we are talking in this way. Then, of course, the meaning of atheism in the Estonian case is sort-of different than in the Western context. It doesn’t mean the explicit denial of God, or something like that. Rather it refers to just not being Christian. And since atheism is the only known secular tradition in the Estonian context it has a very, very wide meaning. CC: Excellent. So we are at about 25 minutes, which is a perfect time for me to just say that obviously we’re recording at the EASR in Bern, in Switzerland. But the 2019 EASR is in Tartu in Estonia. So perhaps you could maybe sell the conference a little bit? Just in terms of why might people want to come? But also, you could give us a hint of the intellectual thrust of the conference. AR: The topic of the conference is “Religion: Continuations and Disruptions”. And, you know, conferences are very much like birthday parties. When you like the people, then you go! And at the same time they are like sort of style parties. And the topic gives the debates this general direction. So this topic was, of course, inspired by Eastern European recent history – which is actually a continuation of different disruptions. And this notion applies to religion as well. And religion and the understanding of religion is constantly changing. So we thought that it would give a good direction for our style party, to become fruitful basis for discussing whatever changes occur in regard to religion. But other than that, Tartu is just a very lovely town. And by the way, our restaurant street is just 50 metres from the conference venue! And for the conference party we have a place called Gunpowder Cellar, which is really an old gunpowder cellar that is turned into a restaurant and claims to be a pub with the highest ceiling in the world. Which is around 11 metres. CC: So, the highest ceiling in the world and the lowest religiosity in the world! AR: (Laughs). Exactly! They go together, hand-in-hand! CC: Fantastic! One final question. (25:00) This conference that we’re at right now, the theme is “Multiple Religious Identities.” So, maybe, just a final thought from you on how the Estonian context and that conference theme of multiple religious identities maybe speak to each other? Or not? AR: Of course they speak to each other: they are both religion-related. But, of course, there are continuations of religious identities, and all this overlapping and constant changing. So I would say this: our conference in Tartu will be a mental continuation of this topic here. CC: Excellent! 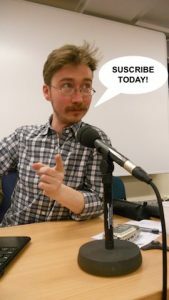 Well, Listeners, if you want to continue with a mental continuation, in about a year’s time we should have a number of podcasts from Tartu for you! But, for now, thanks for that really expansive, but also quite specific, teaser for the situation in Estonia and for your own research. So do check out Atko’s profile. And thank you very much! RSP subscribers get a 30% discount on “Implicit Religion”! Now published in collaboration with the Religious Studies Project, Implicit Religion was founded by Edward Bailey† in 1998 and formerly the Journal of the Centre for the Study of Implicit Religion and Contemporary Spirituality. https://i1.wp.com/www.religiousstudiesproject.com/wp-content/uploads/2016/09/IR-1463-9955-large-e1472732191539.jpg?fit=325%2C488&ssl=1 488 325 Thomas Coleman III https://www.religiousstudiesproject.com/wp-content/uploads/2018/08/logo.png Thomas Coleman III2016-09-01 13:35:082018-08-16 12:49:46RSP subscribers get a 30% discount on "Implicit Religion"! One year before his own death in 1790, Benjamin Franklin, in a letter to the French scientist Jean-Baptiste, codified a witty remark into popular history about two things anyone living can always count on: “In this world nothing can be said to be certain except death and taxes.” You might be able to dodge the taxman, but not death—we are all going to die. Roughly 100,000 years prior to Franklin’s quote the first evidence of intentional human burial appears in the archaeological record (Mithen, 2009). Humans have been thinking about death for a very long time and the threat of nonexistence can be a terrifying reality to face. According to terror management theory (TMT), cultural worldviews, which can manifest religious, political, or a bricolage of other meanings, serve to assuage this fear of our ever impending demise (Jong & Halberstadt, forthcoming). Interestingly, this TMT triage care for the existential self occurs outside of conscious awareness. However, in this podcast interview with Thomas Coleman for the Religious Studies Project, death researcher and psychologist Dr. Jonathan Jong, draws on experimental research as he teases the fear of death and the religious worldviews that may help confront this fear, into your conscious awareness. You can download this interview, and subscribe to receive our weekly podcast, on iTunes. If you enjoyed it, please take a moment to rate us. And remember, you can use our Amazon.co.uk, Amazon.com, or Amazon.ca links to support us at no additional cost when buying academic texts, dihydrogen monoxide, plastic Tyrannosaurus rex replicas, and more. Jong, J., & Halberstadt, J. (forthcoming). Death, anxiety, and religious belief. London, UK: Bloomsbury Academic. Mithen, S. (2009). Peopling the World. In B. Cunliffe, C. Gosden & R. Joyce, The Oxford Handbook of Archaeology (pp. 281-304). New York: Oxford University Press. A few weeks back, I found myself engaged in a one-sided debate with a colleague/friend over the use of the term ‘non-religion.’ As it was at the end of a two-day conference, it was one of those casual conversations wherein certain sophisticated aspects of the preceding academic discourse spill over into the informality of a chat over drinks. In other words: like many a conversation amongst academically-minded friends, the casual simplicity of our conversation was periodically peppered with intellectual debate. This is partly why I refer here to our argument as being rather one-sided, though of course it would be both unfair and erroneous of me to remove myself entirely of any responsibility. After all, I am something of an antagonist [editor’s note: …to say the least]. Then again, I’m also the one telling the story here, so I can shape it any way I wish. Something to consider the next time you read an ethnography. Nevertheless, from my perspective, our discussion felt ‘one-sided’ because it consisted mostly of my friend emphatically and excitedly arguing (perhaps with himself?) against what he perceived was my own emphatic and excited argument that the term ‘non-religion’ has been reified by those who use it for their own cynical gains. While I would, of course, agree that it has definitely become reified (what term hasn’t? ), I could not help but think the argument he was putting forth was veering into a discussion beyond simple term usage. Which, in the end, is partly why I requested to offer this response to Chris Cotter’s interview with Johannes Quack. The other reason for my request is that while I have, for the last five years, been a rather vocal advocate against the term ‘non-religion’ (for a number of reasons that aren’t exactly pertinent to this particular story), I have also, as I assured my friend, come to believe that the term, and its many cognates, shouldn’t be wholly abandoned. That is, just because it doesn’t work for me, doesn’t mean it doesn’t work for someone else. Which, if we really think about it, is the essence of academic discourse. This simple argument here will be the focus of this response, the thesis around which I will be using Quack’s approach to non-religion in an Indian context, to not only point out the benefits of differing theoretical and methodological views, but to also make the larger anthropological argument that this discourse about terminology provides a pragmatically curious solution. I call this thesis: in praise of polyvocality. At the recent XXIst Quinquennial Congress of the International Association for the History of Religions at the University of Erfurt, I had the esteemed pleasure of having Professor Johannes Quack moderate the panel on which I was presenting: “Current Perspectives on Atheism.” Beyond his intriguing, and rather groundbreaking, research on rationalism in India, Professor Quack is perhaps the ideal individual on which to support my thesis. During the question-answer section of the panel, which also included a very interesting presentation by Ingela Visuri on the correlation between autism and Atheism, there began an interesting diminutive debate between Johannes and I over our different term usages. Where this might have, as it has in the past, veered into a discussion between contesting advocates with no real solution provided in the end, it in fact proved extremely advantageous, and not just for the benefit of the audience. At one point, when asked if there was a strict difference between his use of non-religion and my use of the term Atheism, and in particular if the former was merely a more broad or essentialist version of the latter, Johannes kindly responded with a similar answer to the one he gives in his RSP interview about his use of the term rationalist: from a straightforward anthropological perspective, because the individuals being studied identify themselves using a particular term, it would be unfair to impose a different one on them other than the one they use. While this permission to allow one’s subjects to speak for themselves, of course, makes the discussion about term usage even more difficult (especially as subjects tend not to agree on terminology), it also offered a useful insight into the pragmatism of using such different terms, as well as an argument against assigning a general one under which they might be categorized. This also returns my discussion to the issue of reification. Perhaps my greatest argument against ‘non-religion’ has been based on the notion that it stands as a relational umbrella: in the discourse on the academic study of religion, the study of the non-religious represents research being done not so much on the ‘opposite,’ but on the relational periphery. This is something that Chris and Johannes discuss toward the end of their interview. While this might prove useful in the sense that it places the discourse of the study of the non-religious within the larger context of the study of religion, I would argue it also, perhaps by accident, reifies the term in the same way that ‘religion’ has become an umbrella over which we categorize all aspects of being or acting religious. In the end, then, it adopts, from its relationship to ‘religion’, all the issues and ambiguous difficulties we’ve had with that term over the last century or so. This, to me, is less a solution to the problem, than a contribution to it. When we add this to the adolescent growing pains of the study of Atheism, ir-religion, un-belief, non-religion, etc., the result is a rather stunted upbringing. Though I digress. So, then, to move, here, from the critical to the promotional, in Johannes’ answer, as well as via his discussion with Chris about the differences between group and individual identities at the end of their interview, I believe there is a solution to be found: I would argue that a remedy for term reification, be it Atheism, non-religion, religion, or anything relationally similar, and thus a remedy for the terminological issues we may face as researchers, is found within the straightforward anthropological approach which he advocated for in our panel, only turned around in a reflective manner. That is, where we seek out and promote the pragmatic objectivity in permitting each of our subjects to define themselves in their own terms, there is an equal pragmatism in introspectively allowing ourselves to do the same with our own language. While this approach might develop a rather vast terminological discourse, it also breeds a sense of diversity, which, through an anthropological lens, is more beneficial than it is detrimental to our conclusions. In fact, when we take a further step back, and view the academic discourse itself as an anthropological subject, these terminological differences become their own types of individual identities. In this way, our debates over terminology become differing voices all contributing to a discourse that together comes to represent a cultural whole. Thus, our differences of opinion become less problematic, and more representative, a polyvocality that together create a group identity filled with different individual ones. Then, and just like we would with our subjects, viewing this discourse objectively fosters a much more nuanced insight into this culture than, say, an argument that one subject embodies his or her culture more than another. In the end, then, I believe the polyvocality of our discourse is indeed a benefit, particularly because we aren’t all talking about the same thing. Our disagreements and debating and arguing over the proper term usage contributes more and more to the discourse upon which our identity, as an academic endeavor, is formed. Thus, while we might quarrel amongst each other over whether or not our terminology is correct, or whether it better represents our subjects, as subjects ourselves, these discussions are in their own way leading toward a process of identification, and thus a sense of academic congruity. From this third level, then, looking down at ourselves as we look down on our subjects, each layer embodying a unique cultural character, we can better make sense of what it is that we’re studying, as we study it. To do otherwise, to me, seems a bit too much like a one-sided debate. Johannes Quack, Disenchanting India: Organized Rationalism and Criticism of Religion in India (Oxford: Oxford University Press, 2012). Johannes Quack and Jacob Copeman, “’Godless People’ and Dead Bodies: Materiality and the Morality of Atheist Materialism,“ Social Analysis, Vol. 59, Iss. 2, 2015. Lois Lee, Recognizing the Non-Religious: Reimagining the Secular (Oxford: Oxford University Press, 2015). Ethan G. Quillen, “Discourse Analysis and the Definition of Atheism,” Science, Religion, and Culture, Vol. 2, Iss. 3, 2015. It is an unfortunate fact that in popular ‘Western’ imagination, the land of India is frequently orientalised, and naively conceptualized as ‘the quintessential land of religion, spirituality, and miracles.’ Although we would certainly not want to completely invert this stereotype by substituting one unnuanced and inaccurate construct for another, what happens when we take a closer look at a constituency who challenge this narrative, those who identify as ‘rationalists’ and engage in the criticism of ‘religion’ in India? One scholar who has done just that is Johannes Quack in his book Disenchanting India: Organized Rationalism and Criticism of Religion in India, published by Oxford in 2012. In this podcast, we discuss Johannes’ ‘relational’ approach to ‘nonreligion,’ before moving to concrete examples from his work in India. What is a ‘relational approach’ to nonreligion? What does it achieve? What are some of the key characteristics of organized rationalism in India? What does all of this have to do with ‘religion’, ‘non-religion’, ‘atheism’ etc? What does this in-depth ethnographic work in this very particular context contribute to wider academic debates within the study of nonreligion, and religion more broadly? You can download this interview, and subscribe to receive our weekly podcast, on iTunes. If you enjoyed it, please take a moment to rate us . And remember, you can use our Amazon.co.uk, Amazon.com, or Amazon.ca links to support us at no additional cost when buying academic texts, magic wands, faux leather belts and more! We are pleased to bring you this week’s opportunities digest, booming with calls for papers, events and job opportunities! 77th Annual Meeting of the Association for the Sociology of Religion (ASR), 20-22 August 2015, in Chicago, Illinois. Conference report for The Religious Studies Project by Amanda Schutz, PhD student in the School of Sociology, University of Arizona. One of the most prominent recent changes in the American religious landscape is the rise of the “nones,” or those who claim no particular religious affiliation. Richard Cimino and Christopher Smith explore the emergence of a more visible and actualized form of nonreligion in their recent book Atheist Awakening: Secular Activism and Community in America. Ryan Cragun, Warren Goldstein, and Jesse Smith participated in an Author Meets Critics session devoted to this book. While these critics pointed out that some of the organizational history was inaccurate, nonreligious labels (e.g., atheist, agnostic, humanist, secularist) are not interchangeable, and the book would have benefited from more direct engagement with social movement literature, the overall reception was warm. As atheists as a collective continue to grow and organize, their place in the social world—and the religious world—is worth examining. However, as “atheist” becomes an increasingly legitimate and salient social identity and atheists organize into groups that increasingly resemble typical social movements, atheism, in many ways, resembles religion. Indeed, Cimino (who was unaccompanied by his co-author) pointed out that atheists often use religious metaphors, practice secular rituals, and may even refer to their gatherings as “atheist church.” This might not be surprising, as some have argued religious terminology is the best we currently have to describe nonreligious beliefs, practices, and ideologies. The Q&A following the panel ended with a short but lively discussion on whether atheism actually is a religion. The argument goes: if an ideology becomes dogmatic and questioning prevailing wisdom is not tolerated, that ideology has morphed into something akin to religion. In other words, if atheists believe without a doubt that god(s) does not exist, they are, in fact, religious atheists. However, the extent to which atheists as a whole accept such a proposition is debatable. However, scholars of religion are quick to point out that “no affiliation” is not synonymous with “no belief,” and that the nones are comprised largely of those who still retain some level of religious or spiritual belief, despite disengagement from organized religion. Packard quoted several respondents emphasizing that although they have left the church, they have not abandoned their faith. Indeed, this movement away from institutionalized religion is becoming a popular area of study, as researchers are looking more closely at the various combinations of believing and belonging, which include groups like the spiritual-but-not-religious (SBNRs) and cultural Christians (e.g. Orestes “Pat” Hastings, who received this year’s McNamara Student Paper Award and presented “Not A Lonely Crowd? Social Connectedness, Religious Attendance, and the Spiritual But Not Religious”). A third presentation demonstrating this alternative theme, titled “The Rhetoric of Obedience: Gender, Religion, and Family Life in a Modernizing Indonesian City,” took place during the Presidential Panel on religion and gender. Rachel Rinaldo discussed how the rhetoric of submission among Muslim couples is more complex than we might expect. While men remain the head of the family, whose primary obligation is supporting wife and children, it is not unusual for wives work outside the home—though they often must ask permission of their husbands. There are inconsistencies in this worldview, Rinaldo adds: yes, women are by and large considered equal to men, but their utmost responsibility is the home, where they are expected to obey their husbands. However, Rinaldo points out that as women become more involved in public life, public and private spheres becomes more discrete; consequently, as women become more visibly independent and their roles more varied, the rhetoric of submission in the home becomes stronger. The workplace may be an “escape” where women are increasingly welcomed (or at least tolerated), but the household is the “last bastion” of women; it is not as affected by social change as the public sphere. And if women need to be reminded to obey, Rinaldo suggests, that means there must be contexts where they’re not. Because the culture of many Muslim societies is changing, if people still wish to continue traditions privately, they must use religion as a justification of such arrangements—not culture. Though conference themes are intended to encompass the largest possible range of presentations, the meeting included many panels with varying relevance to the theme of religious change. This included panels dedicated to the intersection of religion with topics like health, the environment, gender, sexuality, violence, and politics. This year’s meeting also introduced the ASR’s first attempt at a Graduate Student Mentoring Lunch, which saw a handful of senior scholars discussing their areas of expertise with graduate students. Rhys Williams, a former ASR president, expressed that graduate students today are forging connections with others in outside departments much more than they have in the past, confirming that conferences like ASR have become an integral part in the development of scholars’ early careers. [i] Discussion of presentations is based on those sessions I was able to attend. Also, as a researcher of nonreligion myself, I was prone to see these presentations as particularly exemplifying the theme of religious change. When scholars involved in the social scientific study of ‘religion’ encounter claims concerning ‘religious identity’ – of states, groups or individuals – a number of questions immediately spring to mind. UK Prime Minster David Cameron’s controversy-inducing statement around Easter 2014 that Britain is ‘a Christian country’ is a perfect example of how an apparently simple statement is actually highly ambiguous and can potentially mask a host of powerful ideological concerns. What does Cameron’s statement actually mean? In what sense can a country be “Christian”? Today on the Religious Studies Project, we welcome back Professor Linda Woodhead to discuss and interrogate the question “Is Britain Still a Christian Country?”, the topic of her recent Croall Lectures at the University of Edinburgh. The Secularization Thesis. You can also download this interview, and subscribe to receive our weekly podcast, on iTunes. If you enjoyed it, please take a moment to rate us. And remember, you can use our Amazon.co.uk, Amazon.com, or Amazon.ca links to support us at no additional cost buying academic texts, British cookbooks, cakes, model railways and more. https://i1.wp.com/www.religiousstudiesproject.com/wp-content/uploads/2012/04/linda_woodhead.jpg?fit=200%2C225&ssl=1 225 200 Christopher Cotter https://www.religiousstudiesproject.com/wp-content/uploads/2018/08/logo.png Christopher Cotter2015-03-16 09:15:182016-04-11 03:20:17Is Britain still a Christian country?